Oil pastel is very different from dry pastels. And use them together is not recommended. As the name implies, oil pastels, pigment it is associated with oil, and creates a dense and buttery texture. Of course, compared to soft pastels, the choice of colors is more limited, and gradations of light less. However, the color ranges of this material gradually increased. The color layers can be created with crayons, oil pastels the same as soft pastels or pencils. However, because of their lubricity, there is a tendency of rapid clogging of the grain of the paper. So try to just work with oil pastels easy, not much pressing on the paper. It is best to use only the tip of the pastel sticks. And try to keep it closer to the end – you can't do much to her. Wash in the usual way with oil pastels you will not succeed. But it can be cleaned. If you make a mistake or want to change part of a picture, take a rag, dip it in white spirit or turpentine, and gently wash color. Then wait until the paper is dry, and continue to apply the finishing touches. Let's try to draw a small still life. Now, draw the outline of the orange and lemon (for example) yellow pastel. A paper in this case, it is better to use a bluish-gray, to provide contrast between the bright yellow and orange hues. Causing diagonal lines in orange on both fruits, put yellow. Strokes let it remain open, so you can add color without clogging the paper. After the installation of the primary colors can introduce more contrast and to use the additional orange blue. Stir the shadows on both main fruit color, to neutralize them. To gain additional contrast around the fruit add the gray color is slightly darker shade than used paper. Now you create a form, add the highlights and emphasize shadows. To give the fruit of solidity and texture, experiment with color mixing. 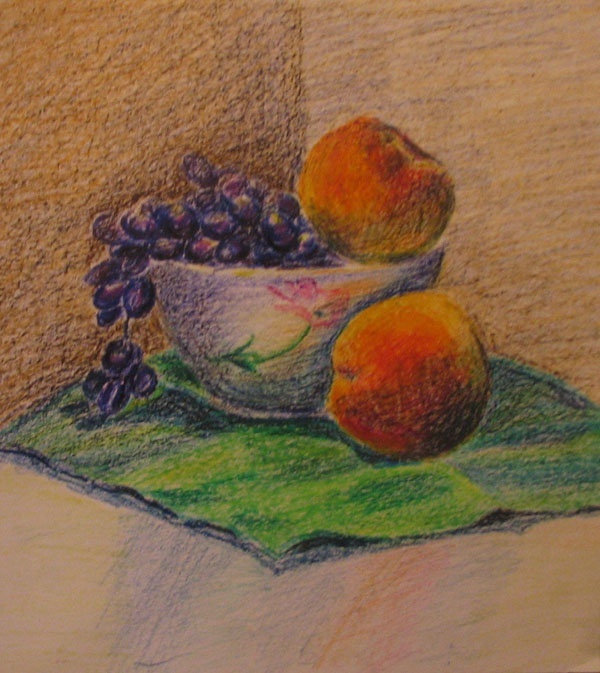 Add fruit and beneath them the orange color light touches of the chalk pastels. This is necessary in order to associate the fruit with the background. Well, a simple still life is ready. The technique of rubbing the pattern with your finger for the purpose of mixing colors in the case of oil pastel is not running. Keep this in mind. But the mixing effect can be achieved in another way: apply color on one another, pushing hard on the sticks of oil pastels.